You are right on target. The "nest" is in a known hardwoods feeding area 20 yards off the creek and on the east side of it. There is not any sun light to speak of in this dark creek bottom. All the hogs i see in this area are smaller herd hogs and sows w/piglets. There is a very "very" thick clear cut across the creek on the west side. This is another known bedding area for both deer and hogs. 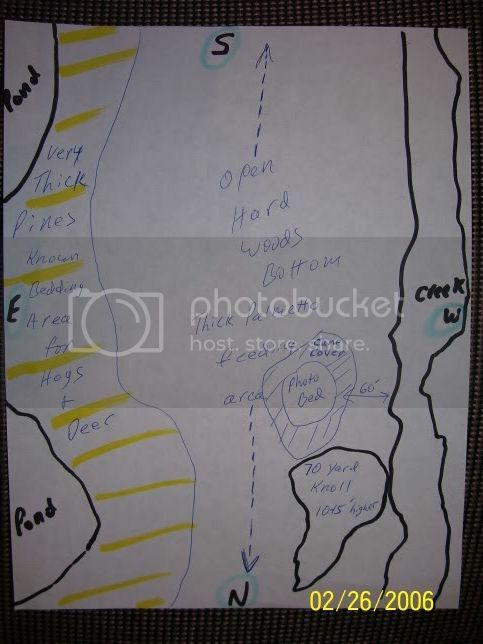 In my experience Clay you are going to find the big boars bedded up in the pine thicket, kind of backed up to that pond if the prevailing wind works to his benefit...if you can get in there (lots of briars usually) you will find some real heavy trails and cut up pine trees, wallows, etc..and your bigger boars will have themselves a few spots in there..but getting there without being detected and the hog exiting ahead of you will be a tough assignment. I have a question about night hunting. I know you do some hog hunting at night. If sufficient moonlight isn’t available have you ever used a small battery powered light in a new set up location. I know you used that battery powered light at the bamboo blind but I didn't know if you had tried this somewhere else. I have no clue how that would affect the game. I thought I would ask for any opinions. Cool pics and posts Clay. Had some of your breading mix again this weekend on some cubed buff steaks. Yum!.....thanks again. Glad you enjoy my breading mix. You need to fry some hog and turkey with it too! If anyone would like to get their hands on my breading mix, they can look up my personal information on Trad Gang to locate my website. Thats a handsome buffalo pedastal mount! Think I will order some of that stuff to try, Clay. I bet it will be great on turkey breast fingers! Ray I didn't know Turkeys had fingers on their Breasts. LOL!! I know better, but I just had to. Gen 27:3 "Now therefore take, I pray thee, thy weapons, thy quiver and thy bow, and go out to the field, and take me some venison;"
by the way, that's one of the ugliest, but most unique, deer mounts I have ever seen. I have the ugliest pig in the world, and you have the homeliest deer....great minds I guess!!!!!!!!!!!! 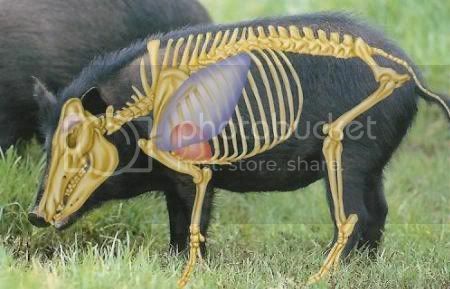 A friend just sent me this illustration of hog anatomy and I thought it was pretty neat. Looks like the visual top of the leg is the place to shoot to get the top of the heart and both lungs under the scapula...assuming it it accurate..
That's a great pic!! I just sent it to my pig rookie partners for an upcoming hunt. The worst thing you can hear from a partner is "I think it was a little back" when hunting pigs. Yea Mike, I've heard that way too many times. The other saying is "I swear, I hit him perfect".... That also translates to, "the shot was a bit far back".. LOL!